Do you have photos, historical accounts or other items pertaining to the Prinsburg area? Would you like to share this historical information with the world? LakesnWoods.com would like to publish your Prinsburg photos (current or historical) or historical accounts on this website. Original materials can be returned and your privacy will be respected. 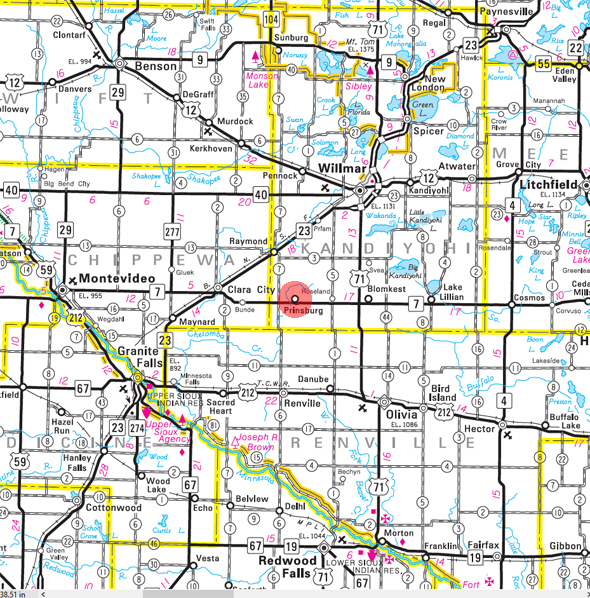 In the southwest corner of Kandiyohi County on Highway 7 is the town of Prinsburg. A town that has established itself as a close-knit community where faith and family are very important. These two Prinsburg values will be evident upon entering the town. With a population just under 500 people, Prinsburg manages to have two, large Christian Reformed churches and a new, private school. The religious dedication and spirit of Prinsburg residents carries out into the community. You’ll find cosmetically neat housing and yards, as well as an overall safe and peaceful neighborhood ideal for raising a family. Prinsburg is a city in Kandiyohi County, Minnesota. Minnesota State Highway 7 serves as a main route in the community. According to the United States Census Bureau, the city has a total area of 1.00 square mile (2.59 km2), all of it land. The elevation is 1,099 ft (335 m) above sea level. As of the census of 2010, there were 497 people, 207 households, and 142 families residing in the city. The population density was 497.0 inhabitants per square mile (191.9/km2). There were 216 housing units at an average density of 216.0 per square mile (83.4/km2). The racial makeup of the city was 97.4% White, 1.2% African American, 0.4% Asian, 0.6% from other races, and 0.4% from two or more races. Hispanic or Latino of any race were 1.2% of the population. There were 207 households of which 28.5% had children under the age of 18 living with them, 66.7% were married couples living together, 0.5% had a female householder with no husband present, 1.4% had a male householder with no wife present, and 31.4% were non-families. 30.0% of all households were made up of individuals and 21.2% had someone living alone who was 65 years of age or older. The average household size was 2.40 and the average family size was 2.94. The median age in the city was 42.1 years. 25.8% of residents were under the age of 18; 5.9% were between the ages of 18 and 24; 21.2% were from 25 to 44; 21.8% were from 45 to 64; and 24.9% were 65 years of age or older. The gender makeup of the city was 49.1% male and 50.9% female. PRINSBURG, a city at the center of Holland Township, section 16, platted in 1886, commemorates Martin Prins, member of a land firm in Holland, who came here and in 1884 acquired about 35,000 acres of railroad lands, mostly in this county. He died in 1887. The city was incorporated as a village June 25, 1952; it began when acreage within the 34,000 acres of land in Kandiyohi and Renville Counties, owned by two partners, Prins and Theodore Koch, was offered for sale in 1885, with the promise that as soon as 20 Dutch families had settled, one half of the cost of a church would be contributed by the partners; 40 lots were sold, and 40 acres in the middle of the township were set aside for a village; the post office was established during three periods, 1887-89, 1896-1904, and from 1927, each time located in the general store.